Welcome to the second installment of FIRESTORM FAN’s Nuclear News! Lots of Justice League related news this time around. Trinity #35 just hit the stands yesterday. As I’ve mentioned previously, Firestorm (Jason/Gehenna) has been featured regularly in the Trinity series. I can’t vouch for issue #35 (as I haven’t read it just yet), but Firestorm has played an important role throughout the series. Justice League of America #29 shipped last week. While it’s a flashback issue and doesn’t feature Firestorm, it was drawn by CrissCross. CrissCross was the first artist on Firestorm volume III, and therefore the first artist to draw the Jason Rusch Firestorm. The Justice League of America team is about to go through a major shake-up. They will be losing Superman, Batman, Wonder Woman, and Green Lantern. Here is an article at Newsarama with writer Dwayne McDuffie discussing the changes. Let’s hope Firestorm stays on the team through these changes. Justice League of America: The Second Coming HC reprints Justice League of America #22-26 and is scheduled for release on May 6, 2009. This volume includes a brief appearance by an alternate reality Firestorm known only as “WE ARE FIRESTORM”. Dwayne McDuffie recently stated on his own forum that we will see more of Jason Rusch and Martin Stein in a future story line. 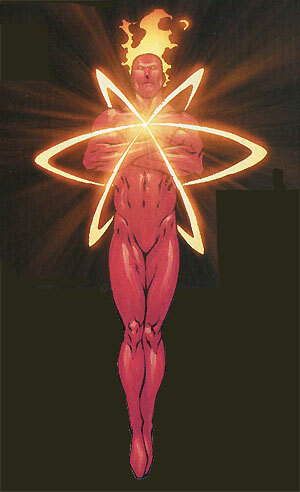 Additionally, he said that “WE ARE FIRESTORM” will appear again. According to Dwayne McDuffie’s blog, this summer will see the release of a softcover edition of Justice League of America: The Injustice League. This softcover will reprint the JLA Wedding Special and Justice League of America #13-16. This is the story where the Jason Rusch Firestorm is “recruited” by Batman for the Justice League. The hardcover of this story was released last summer. Furious Firestorm is a new website from Mr. Jamester. The site is dedicated to our favorite match-head and features lots of images, pictures, and even a few videos. Check it out! As we’ve noted here previously, Ronnie Raymond will return as a Black Lantern during the Green Lantern story, Blackest Night. DC has solicited a few Blackest Night action figures already. Over at Frank Delano’s Martian Manhunter blog, The IDOL-HEAD of DIABOLU, you can see a glimpse of the Black Lantern Martian Manhunter. Wow, icky. Makes me somewhat nervous about how Ronnie Raymond will look as a Black Lantern. Also over at The IDOL-HEAD of DIABOLU, Frank has put together a great resource covering the relationship between Martian Manhunter and Firestorm. He discusses their interactions as well as provides a number of links to other Firestorm-related posts on IDOL-HEAD. Definitely worth your time to check this out! Pat Broderick (the first artist on Firestorm volume II) is scheduled to appear at Florida Supercon in Miami JUNE 5-7, 2009. As always, check out the Firestorm section of the DC Comics Message Board for Firestorm-related discussion. Posted in: Comic books, CrissCross, Dwayne McDuffie, Firestorm #07: Jason post-Infinite Crisis, Justice League of America, Links/websites, News, Pat Broderick, Ronnie Raymond. There’s now 2 Firestorm blogs?!? I don’t think the other site is a blog. I think it’s a more traditional website with covers, art, and video.